But the total solar eclipse will also have imperceptible effects, such as the sudden loss of extreme ultraviolet radiation from the Sun, which generates the ionized layer of Earth's atmosphere, called the ionosphere. This ever-changing region grows and shrinks based on solar conditions, and is the focus of several NASA-funded science teams that will use the eclipse as a ready-made experiment, courtesy of nature. NASA is taking advantage of the Aug. 21 eclipse by funding 11 ground-based science investigations across the United States. Three of these will look to the ionosphere in order to improve our understanding of the Sun's relationship to this region, where satellites orbit and radio signals are reflected back toward the Earth. "The eclipse turns off the ionosphere's source of high-energy radiation," said Bob Marshall, a space scientist at University of Colorado Boulder and principal investigator for one of the studies. "Without ionizing radiation, the ionosphere will relax, going from daytime conditions to nighttime conditions and then back again after the eclipse." 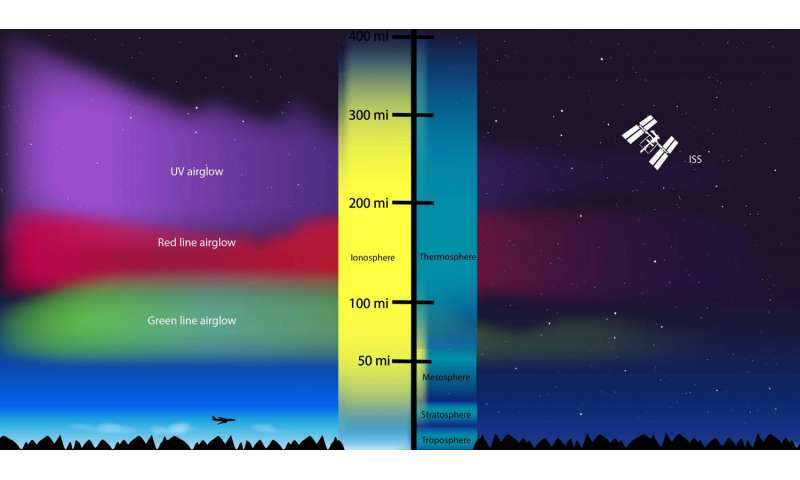 Stretching from roughly 50 to 400 miles above Earth's surface, the tenuous ionosphere is an electrified layer of the atmosphere that reacts to changes from both Earth below and space above. Such changes in the lower atmosphere or space weather can manifest as disruptions in the ionosphere that can interfere with communication and navigation signals. "In our lifetime, this is the best eclipse to see," said Greg Earle, an electrical and computer engineer at Virginia Tech in Blacksburg, Virginia, who is leading another of the studies. "But we've also got a denser network of satellites, GPS and radio traffic than ever before. It's the first time we'll have such a wealth of information to study the effects of this eclipse; we'll be drowning in data." Pinning down ionospheric dynamics can be tricky. "Compared to visible light, the Sun's extreme ultraviolet output is highly variable," said Phil Erickson, a principal investigator of a third study and space scientist at Massachusetts Institute of Technology's Haystack Observatory in Westford, Massachusetts. "That creates variability in ionospheric weather. Because our planet has a strong magnetic field, charged particles are also affected along magnetic field lines all over the planet—all of this means the ionosphere is complicated." But when totality hits on Aug. 21, scientists will know exactly how much solar radiation is blocked, the area of land it's blocked over and for how long. Combined with measurements of the ionosphere during the eclipse, they'll have information on both the solar input and corresponding ionosphere response, enabling them to study the mechanisms underlying ionospheric changes better than ever before. Tying the three studies together is the use of automated communication or navigation signals to probe the ionosphere's behavior during the eclipse. During typical day-night cycles, the concentration of charged atmospheric particles, or plasma, waxes and wanes with the Sun. 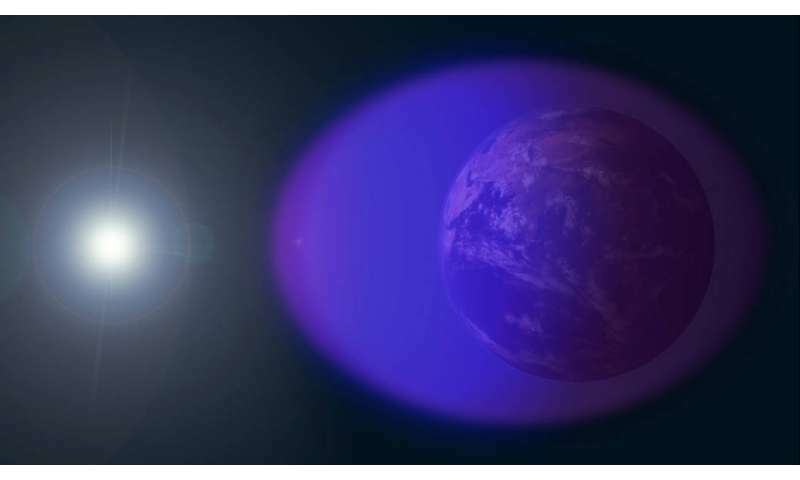 "In the daytime, ionospheric plasma is dense," Earle said. "When the Sun sets, production goes away, charged particles recombine gradually through the night and density drops. During the eclipse, we're expecting that process in a much shorter interval." The denser the plasma, the more likely these signals are to bump into charged particles along their way from the signal transmitter to receiver. These interactions refract, or bend, the path taken by the signals. In the eclipse-induced artificial night the scientists expect stronger signals, since the atmosphere and ionosphere will absorb less of the transmitted energy. "If we set up a receiver somewhere, measurements at that location provide information on the part of the ionosphere between the transmitter and receiver," Marshall said. "We use the receivers to monitor the phase and amplitude of the signal. When the signal wiggles up and down, that's entirely produced by changes in the ionosphere." Using a range of different electromagnetic signals, each of the teams will send signals back and forth across the path of totality. By monitoring how their signals propagate from transmitter to receiver, they can map out changes in ionospheric density. The teams will also use these techniques to collect data before and after the eclipse, so they can compare the well-defined eclipse response to the region's baseline behavior, allowing them to discern the eclipse-related effects. The ionosphere is roughly divided into three regions in altitude based on what wavelength of solar radiation is absorbed: the D, E and F, with D being the lowermost region and F, the uppermost. In combination, the three experiment teams will study the entirety of the ionosphere. Marshall and his team, from the University of Colorado Boulder, will probe the D-region's response to the eclipse with very low frequency, or VLF, radio signals. This is the lowest and least dense part of the ionosphere—and because of that, the least understood. "Just because the density is low, doesn't mean it's unimportant," Marshall said. "The D-region has implications for communications systems actively used by many military, naval and engineering operations." Marshall's team will take advantage of the U.S. Navy's existing network of powerful VLF transmitters to examine the D-region's response to changes in solar output. Radio wave transmissions sent from Lamoure, North Dakota, will be monitored at receiving stations across the eclipse path in Boulder, Colorado, and Bear Lake, Utah. They plan to combine their data with observations from several space-based missions, including NOAA's Geostationary Operational Environmental Satellite, NASA's Solar Dynamics Observatory and NASA's Ramaty High Energy Solar Spectroscopic Imager, to characterize the effect of the Sun's radiation on this particular region of the ionosphere. Erickson and team will look further up, to the E- and F-regions of the ionosphere. Using over 6,000 ground-based GPS sensors alongside powerful radar systems at MIT's Haystack Observatory and Arecibo Observatory in Puerto Rico, along with data from several NASA space-based missions, the MIT-based team will also work with citizen radio scientists who will send radio signals back and forth over long distances across the path. MIT's science team will use their data to track travelling ionospheric disturbances—which are sometimes responsible for space weather patterns in the upper atmosphere—and their large-scale effects. These disturbances in the ionosphere are often linked to a phenomenon known as atmospheric gravity waves, which can also be triggered by eclipses. "We may even see global-scale effects," Erickson said. "Earth's magnetic field is like a wire that connects two different hemispheres together. Whenever electrical variations happen in one hemisphere, they show up in the other." Earle and his Virginia Tech-based team will station themselves across the country in Bend, Oregon; Holton, Kansas; and Shaw Air Force Base in Sumter, South Carolina. Using state-of-the-art transceiver instruments called ionosondes, they will measure the ionosphere's height and density, and combine their measurements with data from a nation-wide GPS network and signals from the ham radio Reverse Beacon Network. The team will also utilize data from SuperDARN high frequency radars, two of which lie along the eclipse path in Christmas Valley, Oregon, and Hays, Kansas. "We're looking at the bottom side of the F-region, and how it changes during the eclipse," Earle said. "This is the part of the ionosphere where changes in signal propagation are strong." Their work could one day help mitigate disturbances to radio signal propagation, which can affect AM broadcasts, ham radio and GPS signals. Ultimately, the scientists plan to use their data to improve models of ionospheric dynamics. With these unprecedented data sets, they hope to better our understanding of this perplexing region. "Others have studied eclipses throughout the years, but with more instrumentation, we keep getting better at our ability to measure the ionosphere," Erickson said. "It usually uncovers questions we never thought to ask."